Orecchiette with Broccoli Rabe (rapini) from Puglia. 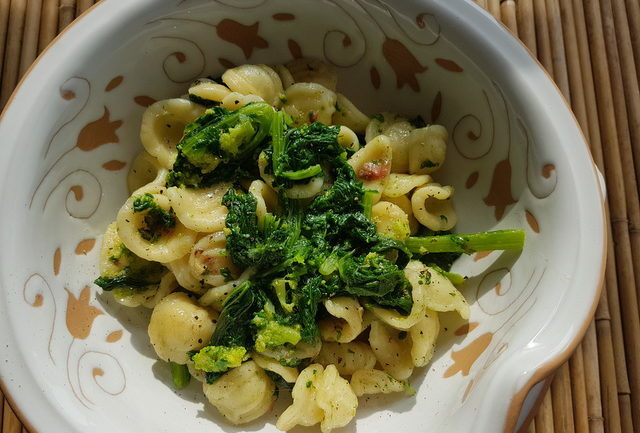 This orecchiette with broccoli rabe, also known as rapini, is one of the signature pasta dishes of Apulian cuisine. However, it is also popular in neighbouring Basilicata and the surrounding areas of Southern Italy. Like so many traditional pasta dishes, this is a simple recipe made with only a few ingredients but it is so surprisingly tasty! In Italy, broccoli rabe has different names. In Naples, it is called ‘friarelli; Romans call it broccoletti; and in Puglia cime di rapa. I wasn’t familiar with these wonderful greens until I came to Italy. Although called broccoli rabe in English, these greens aren’t related to broccoli. Yes, they have little florets which look like broccoli but in fact, are not! 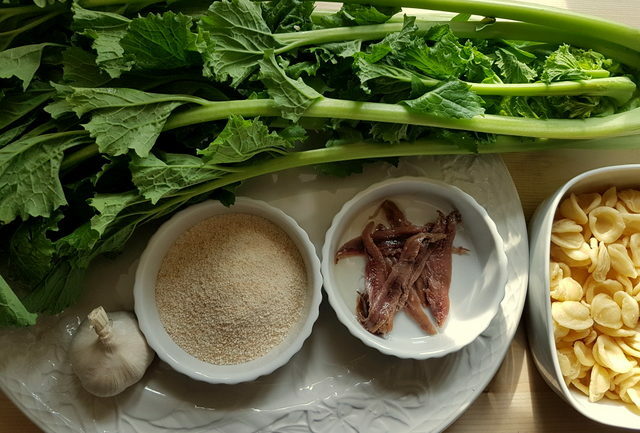 Broccoli rabe is related to turnip greens but it’s not the same, despite the fact that if you ask Google to translate ‘cime di rapa’, it will give you back turnip tops! Broccoli rabe is healthy and delicious. Whichever family this leafy cruciferous vegetable belongs too, it is decidedly delicious, although some people find it slightly bitter. It’s also very healthy; rich in fibre, vitamins and antioxidants. You can eat the leaves, buds, and the stems. 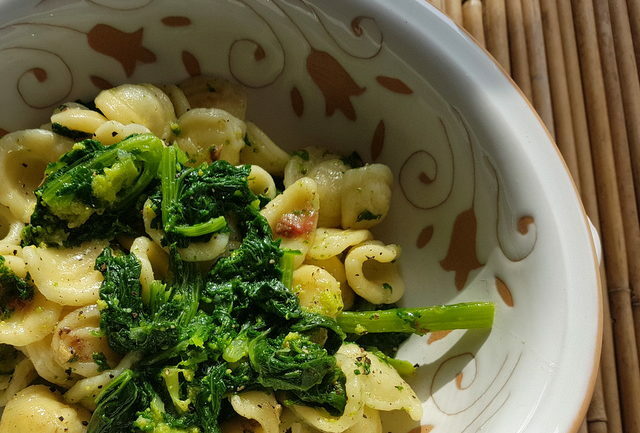 In Puglia, where this recipe for orecchiette with broccoli rabe comes from, these greens are also cooked in a pan in water or steamed like spinach and then fried in olive oil with garlic and served as a side dish or on bread. Orecchiette pasta is traditionally from Puglia, and neighbouring Basilicata, but it is very popular throughout Italy today. The word ‘orecchiette’ means ‘little ears’ and, obviously, the name derives from the shape. 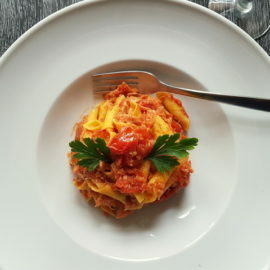 This pasta is said to have become popular in Puglia between the 12th and 13th century, so it is definitely of ancient origin. However, some food historians say that originally orecchiette arrived in Southern Italy from Provence during the 13th century with the Angevins, who brought a form of pasta with them called ‘crosets’ similar to the orecchiette of today. In Puglia, orecchiette are still often made by hand and of course this pasta is delicious when homemade, I used fresh orecchiette, which I’m lucky enough to be able to buy locally. 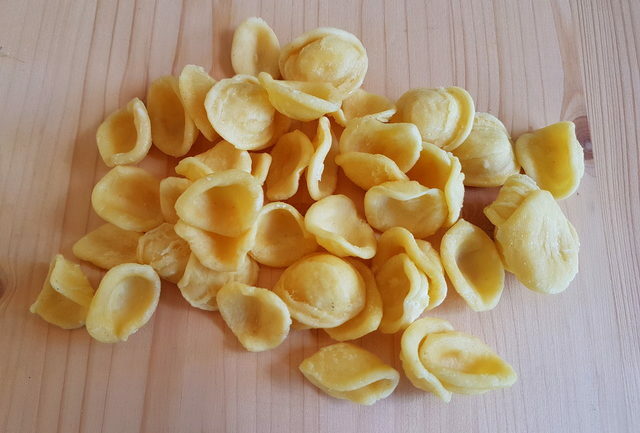 If you don’t want to make the pasta yourself and cannot buy it fresh, many pasta producers sell good quality dried orecchiette. 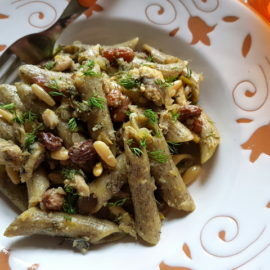 Certainly, this recipe can be made with other types of pasta such as cavatelli or penne, but somehow broccoli rabe and orecchiette belong together. How to make orecchiette with broccoli rabe. The simplest way this dish is eaten involves just boiling the pasta and greens together and then dressing them with extra virgin olive oil, grated cheese and pepper. 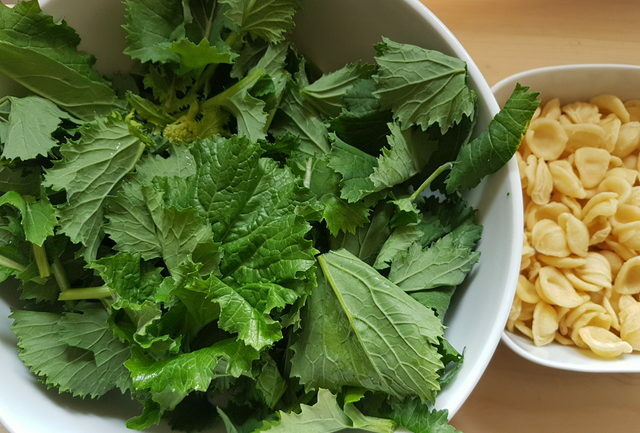 Some people don’t boil the pasta and greens together but boil the pasta in the water in which the broccoli rabe was first cooked. In the past, the poorer people didn’t use olive oil, as this was reserved for the rich. Instead, they fried the orecchiette with broccoli rabe in lard before eating it. The recipe I followed is probably the most popular today. It requires a little more work and a couple more ingredients but is still super simple. 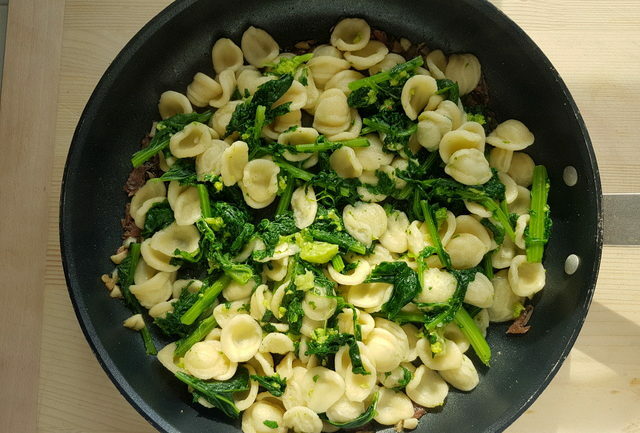 I cooked the broccoli rabe and orecchiette together, starting with the greens and then I added the pasta a bit later. Fresh pasta requires less cooking. If you are using dried pasta you can cook it with the vegetables at the same time. 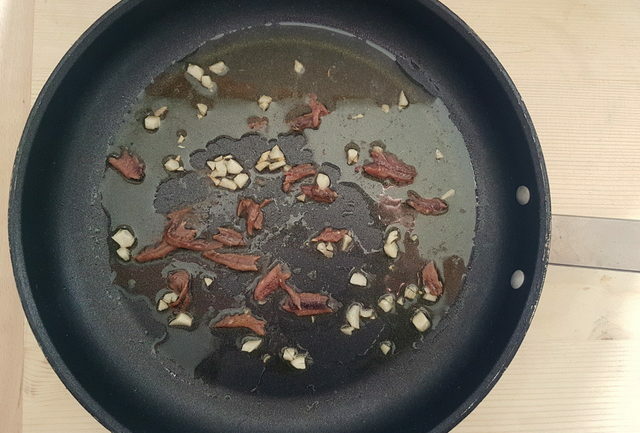 While the pasta and greens were cooking, I fried the garlic and anchovies in extra virgin olive oil (you can also add fresh peperoncino if you want it a little spicy). Then all you need to do is drain the pasta, mix it with the garlic etc and add grated cheese or toasted breadcrumbs before serving! Fast, simple and delicious! I’m sure if you try it, you’ll love it! That broccoli rabe looks delicious but I’ve not seen it in France yet. 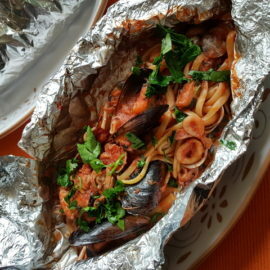 This recipe looks so simple and delicious with the anchovies too! Thanks so much Amanda! Yes broccoli rabe is really delish. I love using it with pasta and just eating it as a side dish! 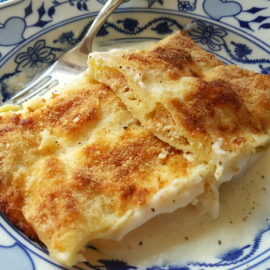 I hope you’ll be able to find it and give this recipe a try! Salute da Verona Jacqui. Starting sauces off with ‘melting’ anchovies adds so much more to a recipe than the mind would imagine, this looks delightful! Looks delicious. Never had before but can’t wait to try. Thank you for sharing.